When Apple introduced iCloud at 2011’s Worldwide Developers Conference, the company touted the online service's ability to seamlessly sync your contacts, calendars, reminders, notes, images, documents, and other data, along with a free mail account, remote access to other iCloud-enabled computers, and a locator for lost portable devices. While iOS 5 took early and extensive advantage of iCloud on the iPhone and iPad, OS X Lion did less with it: You could sync your mail, contacts, calendars, reminders, and notes, and send images to your iPhoto library via Photo Stream, but not documents or program settings. With Mountain Lion, however, Apple has added new features to iCloud and integrated those sorely missing from its desktop OS. The biggest of these additions is called Documents in the Cloud. This feature allows the app you’re using to store your documents in the cloud, wirelessly and remotely; you can then access them from any computer or iOS device you’ve linked to iCloud that has that application installed. Unlike your Mac’s traditional Finder, each app has its own iCloud Document Library; there’s no master list of all your cloud-based documents. 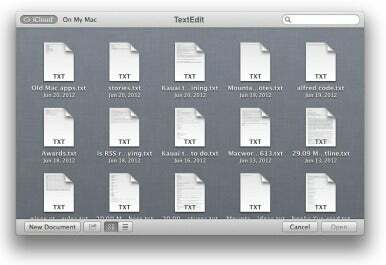 That could make for some confusion if you use multiple apps—text-editing programs, for example—to edit the same kinds of documents. 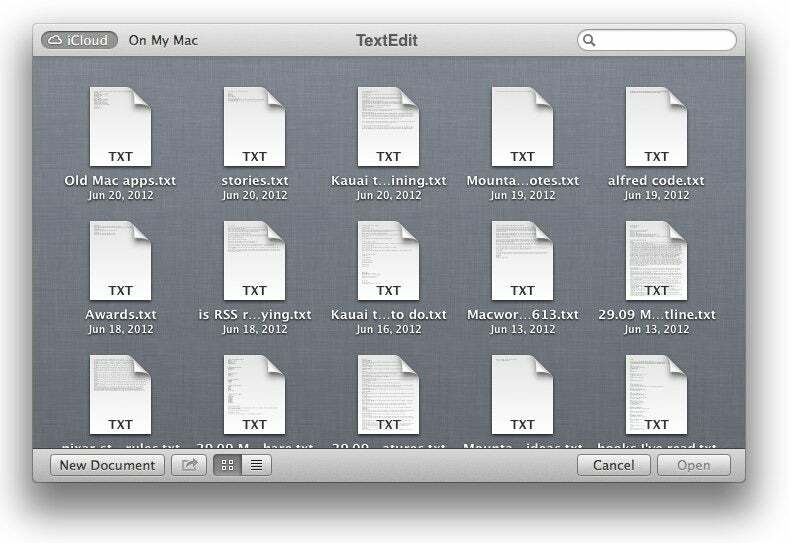 When you open a file in an iCloud-supported app, the Document Library window pops up. It looks similar to the template selection window of apps like Pages—a single-pane window with the dark-linen background with files shown as icons or in a list (your choice). In Icon mode, you can organize files by name or date; List mode lets you sort by size, too. Along the top of the window, there’s a search bar (in case your list of files grows unwieldy) and a toggle that lets you switch from your Document Library to the standard Open dialog for files on your Mac. Every iCloud-compatible app gets a new Open dialog, where you can select files stored either in your iCloud Document Library for that app or on your Mac. If you like to organize your files into folders, you can do so iOS-style, by dragging one file's icon on top of another's. That will create a folder containing both of them. Unfortunately, folders can’t be nested, but you can drag them from Document Library to the Finder (or to another Document Library) just as you would a file. Opening a file in the Document Library is as simple as double-clicking it. Files stored in iCloud retain their full Versions history, so you can use Auto-Save, restore past versions of your files, and duplicate them with ease. If you no longer want a file, you can move it to the Trash by dragging it there or Control- or right-clicking it and selecting Move to Trash. Once you do so, that file will be inaccessible from all iCloud-connected devices. When Mountain Lion initially shipped, Apple’s TextEdit, Preview, and the iWork suite all supported Documents in the Cloud. Third-party developers can also integrate Documents in the Cloud into their apps, but only if those apps are sold in the Mac App Store; apps that aren't in the Store can't support DitC. Mountain Lion also supports some new iCloud syncing options. Mail, calendars, and contacts still sync that way. But now tasks and text snippets sync via the new Reminders and Notes apps (respectively), rather than through Calendars and Mail. Speaking of Mail, iCloud syncs a bit more of your data now: recent senders, favorites, signatures, flag names, smart mailboxes and mail rules (across OS X only), and your account information. Safari also gets an iCloud boost: Synced tabs allow you to start browsing the Web on your iPhone and immediately pick up where you left off on your Mac. Macs running Mountain Lion will have a Cloud icon in the Safari toolbar; click on it, and you’ll see a list of your iCloud-enabled devices and any open Safari tabs or windows below them. Unfortunately, you can’t manually refresh this list, so you have to wait for iCloud to catch up and sync if you’ve just opened a new tab on one device; that said, the process is usually fairly quick, taking no more than a minute or two.